A series of rolling street protests by pensioners angry with the government over five straight years of miniscule rises in retirement benefits will move to Valencia on Thursday, following more than a hundred marches on Saturday that turned out tens of thousands in towns and cities across Spain to demonstrate against the government’s pensions policies. The march in Valencia, delayed at the weekend because of the finale of Valencia’s weeks-long celebration of the city’s annual Fallas celebrations, is expected to keep the pressure on the Partido Popular (PP) government of President Mariano Rajoy, which has angered old-age pensioners with its rebuff of demands that the government increase the annual increase in retirement benefits from the 0.25 percent per year that has been in place since 2013. 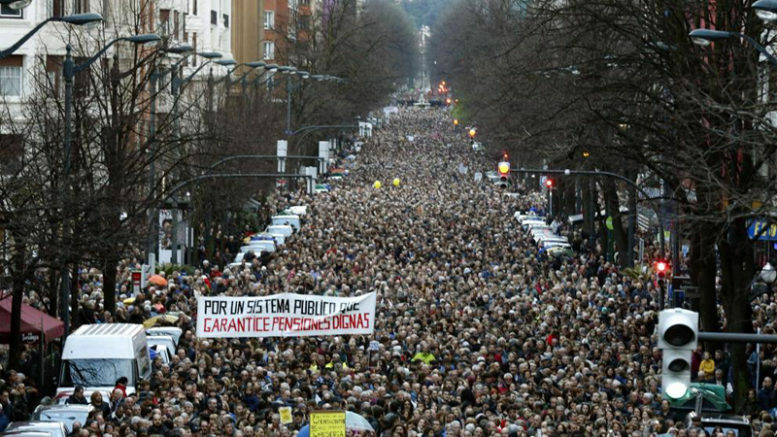 Backed by Spain’s largest labour federations and leading leftwing parties, the pensioners are demanding a complete overhaul of the way in which retirement benefits are calculated and an annual cost-of-living increase in line with the national consumer price index (IPC), used for calculating inflation in Spain. Spain’s IPC rose by 0.6 percent last year – nearly trip the amount of the rise in retirement pensions – and since 2013 the index has risen by 2.1 percent, while the annual increase in the paltry public-pension benefits received by many retirees in Spain has risen by just 1.25 percent in the same period. While the Rajoy government says it is unwilling to pass any increase to pensions above the 0.25 percent proposed, on Wednesday a PP spokesman said the government is considering exempting old-age pensioners who earn less than 17,000 euros per year from paying taxes as compensation, as well as instituting an exceptional increase in the retirement benefits received by women who are widowed and have not remarried.